Black channa is more healthier than the white channa. But most of them like white channa. 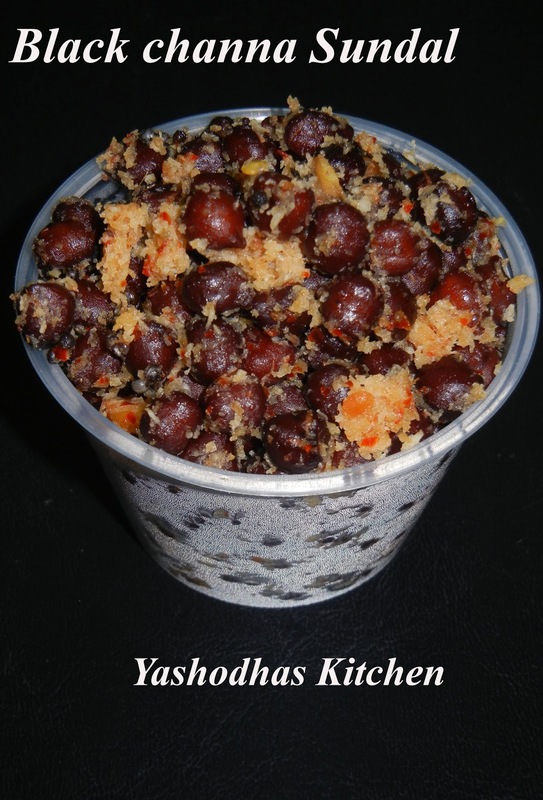 If you add this spicy masala to the black channa, it is very tempting and yummy to eat. This would play a vital role during Navarathiri and Vinayakar chathurthi days. This is a simple and healthiest evening snack which contains lot of proteins. It is one of my hubby's favorite sundal. Once the pressure gets down, remove it from the cooker and strain the water. Show the channa in the cold water to avoid getting smash. Heat oil in a pan, once it gets heated, add mustard seeds. Wait until it splutter, then add urad dal, hing powder and curry leaves. Salute it for less than a minute. Add the boiled channa into the same pan and mix well with the seasoning. Add the ground spicy masala to it and allow it on the heat for 2 or 3 minutes or until the raw smell goes from the masala. Then remove it from the heat and serve as such as a wonderful healthiest snack. Thank you Ramy .. How are you? Where are you now? Delicious black chana sundal love it.